Steps :-Aluminium 26mm square corrugated (Optional FRP 32 mm round Corrugated supported by aluminium tube). 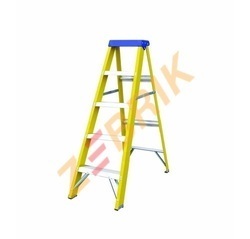 Fiber Glass platform ladders are useful for industrial use. Being a well-established organization, we are engaged in offering a distinguished range of FRP Ladder. New Star Electrical & Mech. Ind. Matching with the ever-growing and varying needs of customers, our company is manufacturing, supplying and exporting a large range of Fiber Glass Ladder. Our offered product is highly demanded in the market for its usage in homes and many more applications. The offered product is used to pick items that are placed on heights.